honest it was not what I was expecting but it was very good anyhow. is meant for people with appetite like the one of Gargantua. usual. My sister had the steak tartare. A classic of French cuisine. … the rest! I couldn't even identify most of the pieces. and put it into my mouth. It's surprisingly good. mouthful is psychologically a challenge. I need to breath profoundly. the one in a butcher shop. headcheese or anything like it. dinner with a baba au rhum, a spongy cake soaked in rum. Now it's time to think about what my first meal of 2010 should be. Siroc Restaurant, 915 15th Steet in Washington, DC. Lunch with Lurker W's older brother... the tax masta of K Street. We had the 4 appetizers - octopus 'salami'; beef rolls; potato torte and scallops with artichokes. For the main plates, we had capellini with clams and tagliatelle with scallops. A good time was had by and well worth a return trip. Bistro Bis, Washington, DC. After a great brunch a few months ago, I decided to return to this restaurant located close to Capitol Hill. For starters I had venison sausage followed by cassoulet. While not the rich, creamy one I had at Christian Constant's restaurant in Paris, it was pretty good. Made all the better, with a few glasses of gamay. After a cold and wet soccer game we were in need of some food and warmth so we found ourselves at Gennaro's, at the corner of Hyland and New Dorp Lane on Staten Island. 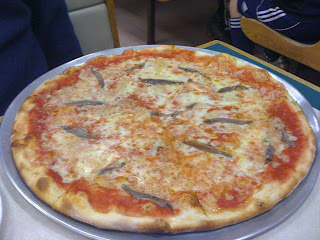 We had a large plain pie and one with garlic and anchovies. While I can't say it was the best pizza, it was fresh and hot and a perfect stop after a game at Miller's Field. I had a surprising decent lunch at Opia Restaurant. I had eaten there a few times before and was quite disappointed. Today was a pleasant surprise, particularly the beef, which in the past had been cooked to a tough, chewy, gray hunk of meat. If you want to buy Italian Kiwi Fruit, that's Price Look-Up code, or PLU, you'll need. Otherwise, you might be charged for homli fruit (#4300)! Conventionally grown products will have a 4 digit PLU code. Organic products will have a 5 digit code starting with the number 9. Genetically engineered (GE or GMO) products will have a 5 digit code starting with the number 8. My kiwi fruit was not organic.